2018 Visionaries Tribute Honorees Announced! Our fifth annual Visionaries Tribute will take place on November 8, 2018 at Manhattan’s Edison Ballroom. Veteran filmmakers Wim Wenders and Orlando Bagwell will receive Lifetime Achievement recognition. The Robert and Anne Drew Award for Documentary Excellence will go to Elizabeth Chai Vasarhelyi and Jimmy Chin (Meru, Free Solo) and the Leading Light Award will go to Tabitha Jackson, Director of the Sundance Institute’s Documentary Film Program. The festival announced Netflix as its Leadership Sponsor supporting the Visionaries Tribute. The NEON Shorts Award will debut at this year’s Visionaries event. The team at NEON will select one short from the DOC NYC lineup to honor with the opportunity for theatrical distribution. The winner will be announced on November 8. The Lifetime Achievement Award honors individuals with a substantial body of film work. Past recipients are Sheila Nevins, Errol Morris, Stanley Nelson, Jonathan Demme, Barbara Kopple, Jon Alpert, Frederick Wiseman, D.A. Pennebaker, Chris Hegedus and Albert Maysles. Wim Wenders has directed the Oscar-nominated documentaries The Salt of the Earth, Pina and Buena Vista Social Club, along with nonfiction titles such as The Blues and Room 666 and celebrated fiction films such as Paris, Texas and Wings of Desire. His latest documentary is Pope Francis: A Man of His Word. Orlando Bagwell’s directing credits include Citizen King, A Hymn for Alvin Ailey, Malcolm X: Make It Plain, and two episodes in the landmark Eyes on the Prize series. Serving as a program officer at the Ford Foundation for nearly a decade, Bagwell established the $50 million JustFilms fund. He is currently finishing a documentary on Gil Scott-Heron. The Robert and Anne Drew Award for Documentary Excellence is named for the pioneering husband and wife filmmaking team. The award includes a $5,000 cash prize to the filmmakers, contributed by Drew Associates, under the helm of Jill Drew. The award honors a mid-career filmmaker or partnership that excels in observational filmmaking. Past recipients include Heidi Ewing and Rachel Grady, Dawn Porter, Kim Longinotto, and Laura Poitras. Elizabeth Chai Vasarhelyi and Jimmy Chin, the filmmaking team behind Meru and this year’s Free Solo. Vasarhelyi has additional solo directing credits on other films including Youssou N’Dour: I Bring What I Love, Touba, A Normal Life and the award-winning Incorruptible. Chin is also a professional climber and has an accomplished career as a photographer for National Geographic and other outlets. 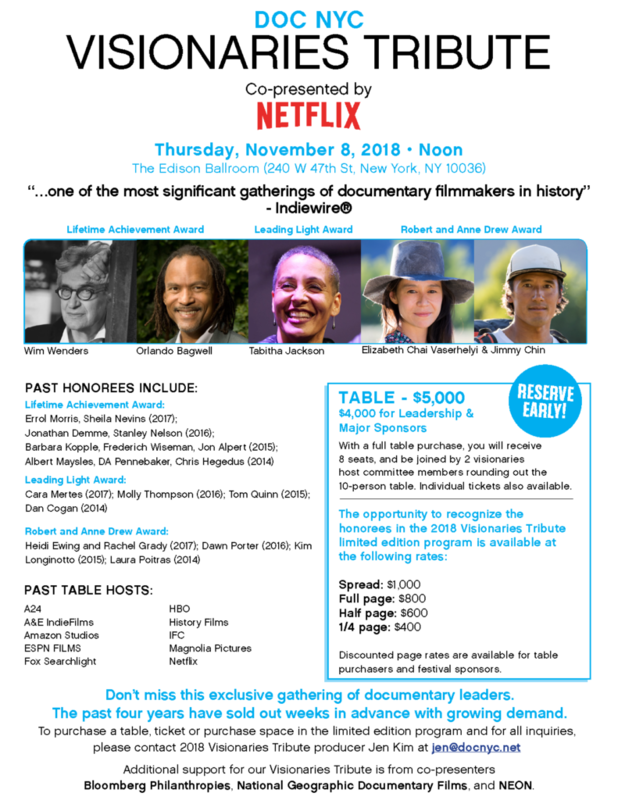 The Leading Light Award honors an individual making a critical contribution to documentary in a role other than as a filmmaker. The past recipients are Cara Mertes, Molly Thompson, Tom Quinn, and Dan Cogan. Tabitha Jackson, who has served as the Director of the Documentary Film Program at the Sundance Institute since 2013. She previously worked as the Head of Arts and Performance at Channel 4 Television in London. The Visionaries Tribute honorees are identified by recommendations from members of the Host Committee from past years and chosen by the festival’s programming team. The 2018 Host Committee will be named in October. Additional support for the Visionaries Tribute is provided by Bloomberg Philanthropies and National Geographic Documentary Films.